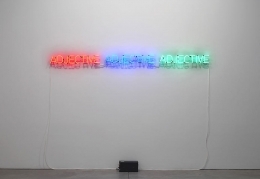 Sean Kelly Gallery is delighted to announce a major exhibition by Joseph Kosuth of important early works dating from 1965 to 1970. 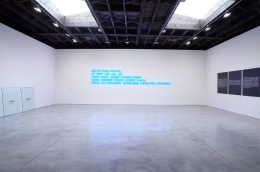 Joseph Kosuth is the seminal pioneer of Conceptual art and installation art; in 1965 he initiated language and photo-based works, and appropriation strategies which he has pursued and developed over the last forty years. 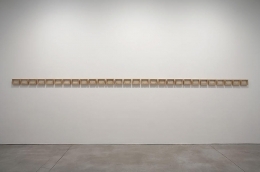 Kosuth made his first conceptual work Leaning Glass, in 1965. It consisted of any five-foot square sheet of glass which could be leant against any wall. An important four-part glass piece from this period will be presented in the exhibition, consisting of sheets of glass inscribed with the words Glass, Words, Material and Described. 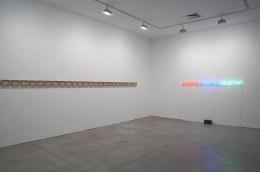 In 1966 Kosuth also embarked upon a series of works entitled Art as Idea as Idea, involving texts, through which he probed the condition of art. 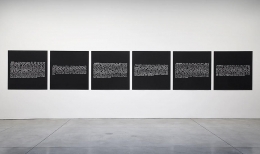 The works in this series took the form of photostat reproductions of dictionary definitions. An important six-part definition - Blue, Orange, Green, Purple, Red and Yellow - is included in the exhibition. 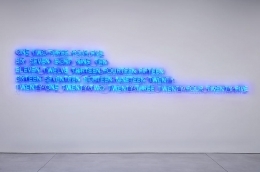 Kosuth began producing neon works in 1965. 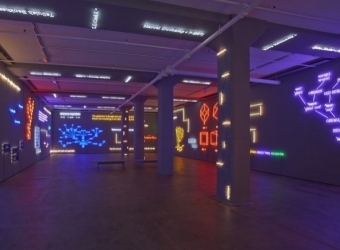 Perhaps the most historically important neon he ever made - Five Fives (to Donald Judd), 1965 is incorporated in the exhibition. 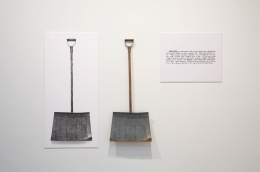 One and Three Shovels, 1965, is another key piece included in the exhibition. 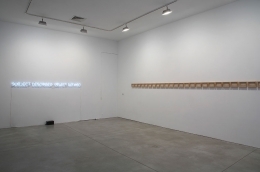 Kosuth described the process employed in the one and three works as follows: "I used common, functional objects – such as a shovel – and to the left of the object would be a full-scale photograph of it and to the right of the object would be a photostat of a definition of the object from the dictionary. Everything you saw when you looked at the object had to be the same that you saw in the photograph, so each time the work was exhibited the new installation necessitated a new photograph. I liked the fact that the work itself was something other than simply what you saw." 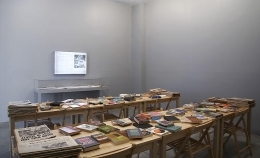 Also on view will be the twenty-eight part work The Sixth Investigation, 1969, as well as the Information Room (Special Investigation), 1970, in which a library is organized together with contemporary philosophical and art-theory publications, presented for viewers on library tables. 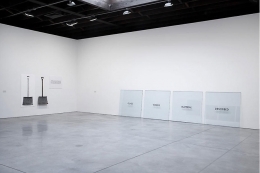 The totality of the exhibition is a reflexive discourse on the artist's early oeuvre and the revolutionary role he played in the groundbreaking reevaluation of art in the 1960's. 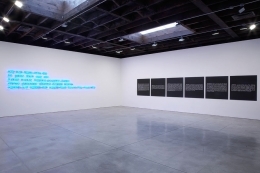 Joseph Kosuth is one of the pioneers of Conceptual art and installation art; initiating language and photo based works and appropriation strategies in the 1960s. His work has consistently explored the production and role of language and meaning within art. 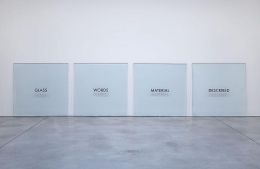 His nearly forty year inquiry into the relation of language to art has taken the form of installations, museum exhibitions, public commissions and publications throughout Europe, the Americas and Asia, including five Documenta(s) and four Venice Biennale(s), one of which was presented in the Hungarian Pavilion, 1993. Awards include the Brandeis Award, 1990, Frederick Weisman Award, 1991, the Menzione d'Onore at the Venice Biennale, 1993, and the Chevalier de l'Ordre des Arts et des Lettres from the French government in 1993. He received a Cassandra Foundation Grant in 1968. In June 1999, a 3.00 franc postage stamp was issued by the French Government in honor of his work in Figeac. In February 2001, he received the Laura Honoris Causa, doctorate in Philosophy and Letters from the University of Bologna. In 2001 his novel 'Purloined' was published by Salon Verlag. In October 2003, he received the Austrian Republic's highest honor for accomplishments in science and culture, the Decoration of Honor in Gold. 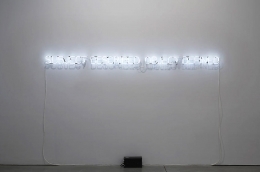 Concurrent with this exhibition, important Kosuth works are included in an exhibition at the Hirshhorn Museum, Washington D.C. that presents recent acquisitions from the collection of Count Giuseppe Panza, the exhibition opens on October 22. The preview of this exhibition in New York will take place at Sean Kelly Gallery on Friday, October 24th from 6pm until 8 pm. The artist will be present. reads: The world is already constituted, but never completely. M.M.-P.